Still embroiled as I am in the creation of a new series of works that are a new direction for my art, I have found myself pulled into the intrigue of the Brushes application, for the iPhone and iPad. Famously used by David Hockney in his recent exhibition in Paris, in which he displayed the artworks on lots of iPads to which he continually mailed new images, Brushes is a new kind of art application for the touch-sensitive generation of devices. 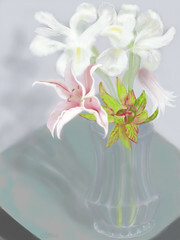 iPad drawing- number 7 "vase on my coffee table"
Whereas my painting is planned, executed in careful layers, and relates to themes that can last years, my iPad drawings are fast, thoughtless (no, really), instinctive doodles. Drawing on the iPad feels light-hearted, and of no importance. 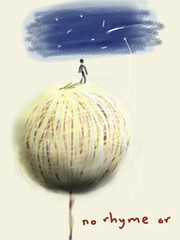 I can also make them as various, and diverse as I like, and I can create several in one sitting. I can carry the iPad in my bag, and I don’t get my hands dirty either. They typically take me less than five minutes – although as Hockney has demonstrated, it is quite possible to spend more time, take it more seriously, and create some serious art. His work on the iPad, as well as the famous flowers, also contains self-portraits and landscapes that are recognizably Hockney, and deliciously painterly. 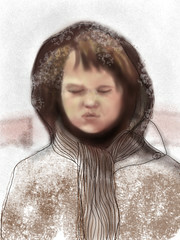 The Brushes app itself is cleverly limited in its scope, which is why it works for me, as a painter. There’s no pre-created ‘shapes’ to choose from, just a variety of lines with adjustable opacity and width. The ‘fill’ command fills the whole screen, not sections. There’s no instructions on how to use it, no suggestions, and so the age-old problem of what to draw remains in the hands of the artist. It does offer up to five layers however, and it is the layers that I am finding so intriguing. I can layer translucent colors on top of each other, to create a great sense of depth instantly, especially as the viewing devices are back-lit: these drawings literally glow. The big change for me with Brushes as compared to previous digi-draw products has been the arrival of the touch-sensitive screen. Even the pen and tablet technology that is so beloved of graphic designers and artists using photoshop, and so forth, feels very different to me than being able to ‘rub’ colors and lines onto my ‘paper’. These marks that I make are of course edited by the software, in that it edits the colors and lines to take the chosen form – no accidental smudging here, as if you’ve chosen a translucent, faded line setting then that is what you will get. With real-life drawing media, this delightful dirtiness can lead to new expressions and ideas, and learning to create even a straight-forward ‘line’ requires time, practice and is replete with questions, challenges. For touch-sensitive art, the new expressions arrive more cleanly perhaps, and take less skill in terms of their execution, but perhaps also more inventively. Running with an idea on the iPad has no ‘waste’ other than time (and not much of that) and no monetary cost for supplies, so there’s less to hold me back. It is true however that currently these works are fast, and I have only been following my sketching regime for about two weeks. I hope to improve on my touch-sensitive skills over the months, and it is likely that my views on this will change as this happens. I may try using the iPad to create sketches that I then create in more traditional media, so in a sense use it like a traditional sketch book. I am not sure yet. I like not being sure yet. Maybe I needed some light relief. 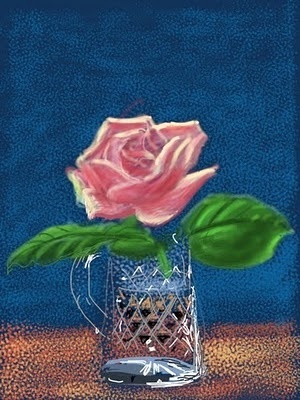 >>> A Slide Show about Hockney’s iPad drawings by the New York Times. 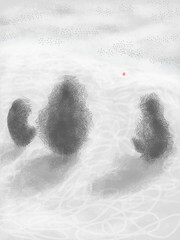 I just got an ipod touch for Christmas and immediately bought the brushes app after seeing your digital art. It’s so addictive to just doodle and sketch and play with colors. I haven’t even played with the layers part yet. 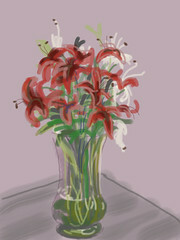 And a Hockney app would be brilliant! hi Rachel – I am thrilled you are now also hooked! Perhaps you could post them on twitter using the hashtag #iDraw and then I’ll be sure to see them. I know there’s tons more to discover speaking personally. I was looking at Hockney’s again today, and he uses layers and textures very effectively.